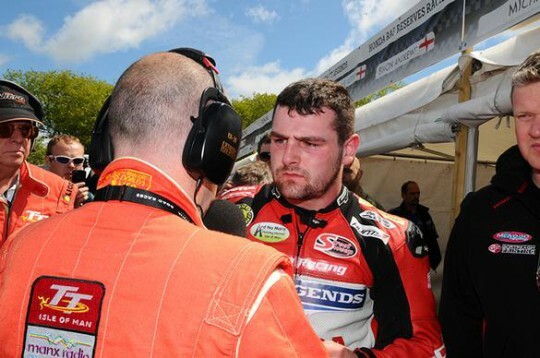 Ballymoney’s Michael Dunlop added to his Dainese Superbike TT victory yesterday with a win in this morning’s first Sure Supersport race and adding a fifth TT title to his overall tally and setting a new Supersport race record in the process. Dunlop managed the race from start to finish and was dominant from Ramsey on the opening lap to pull a gap of ten seconds over Bruce Anstey, who is still suffering from flu, which he maintained to the chequered flag. Older brother William Dunlop, who was fastest out of the blocks and led for the first half a lap, finished in third place and 23.5s down on the Milwaukee Yamaha. His team-mate Conor Cummins retired at the end of lap one. Ramsey saw Michael take the lead and he dragged Anstey with him. At the Bungalow, Michael led the Kiwi by the business end of three seconds while Guy Martin hauled himself into fourth place and Hiller dropped out of the top five, replaced by John McGuinness on the HM Plant Padgett’s Honda. At the grandstand, Michael’s lead had increased to four seconds over Anstey while Wilson Craig Honda’s Cameron Donald put a charge over the Mountain to slot into fourth ahead of Martin on the Tyco Suzuki. Michael then got his head down and pulled away. The top three settled down with William in third place and 12s down on his brother while Martin reclaimed fourth place and pushed Donald back to fifth. By the time they reached the granstand for the first set of pitstops, McGuinness was ahead of Donald for fifth place and at Ballaugh on lap three, Michael was also leading on the roads as the gaggle of Hondas, plus Hillier, lapped together. At Ramsey, McGuinness was up to fourth place with Martin now down in fifth as Donald began to slip down the order and it looked like the top five places were set. But Hillier was having none of it and he was back into fifth ahead of Martin at the Bungalow on lap four while McGuinness was hauling in William Dunlop for third. It wasn’t to be, however, and the 19-time TT winner had to settle for fourth with Hillier fifth and Martin crossing the line in sixth place. Donald eventually finished in seventh place. Youngster Dean Harrison barged his way up to eighth ahead of Dan Stewart while Dan Cooper, who dislocated his shoulder at Kirkmichael yesterday, was tenth. Dan Kneen, Jamie Hamilton, David Johnson, Robert Wilson and Davy Morgan complete the top 15.